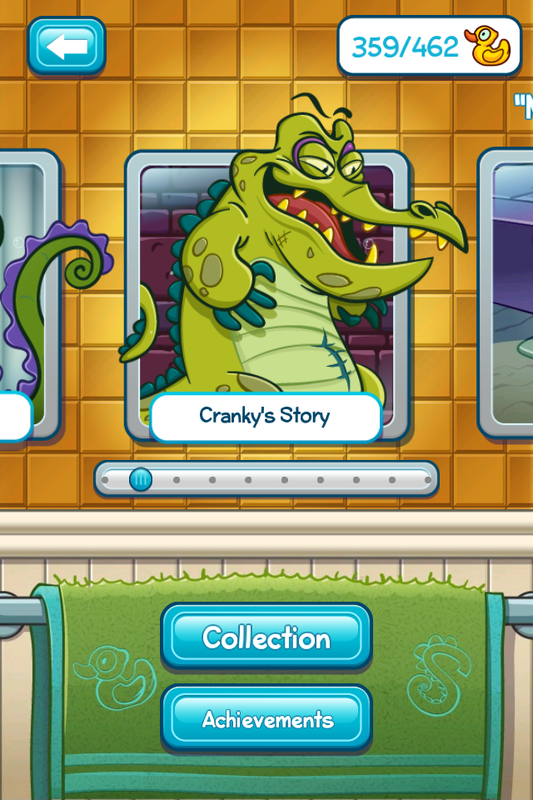 When we first started with “Where’s My Water?”, we were following the story of Swampy. 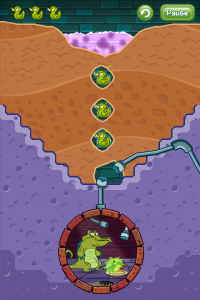 The game has expanded to give a little hint of Cranky, another alligator. 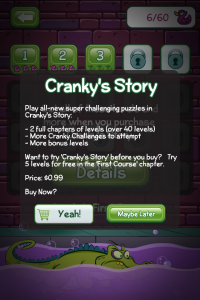 You get access to five levels, but will need to pay another $0.99 to gain access to more. 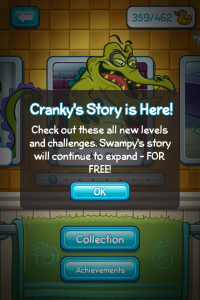 Cranky’s Story is kind of an “opposite world” to Swampy. 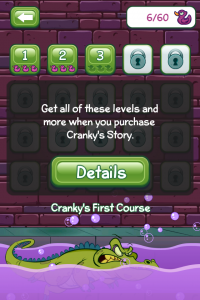 In Cranky’s Story, water is not desirable and becomes your enemy. 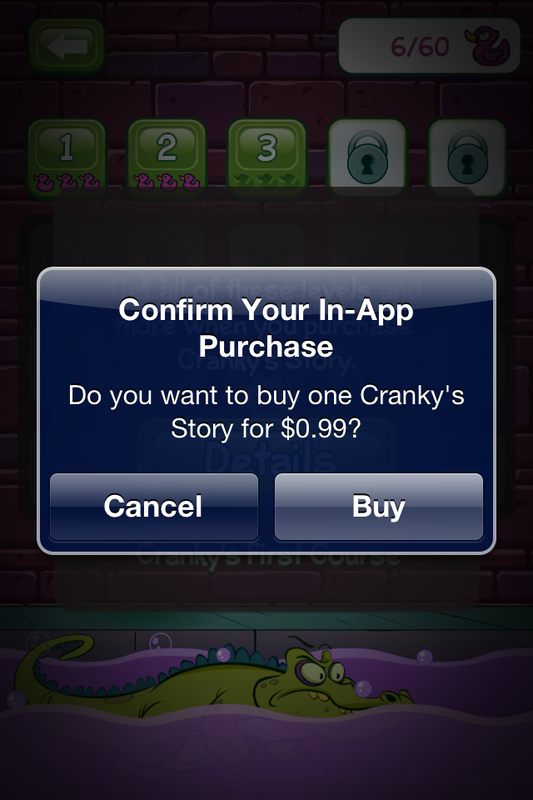 Once you get the update and launch the app, you’re notified of the addition of Cranky’s story. 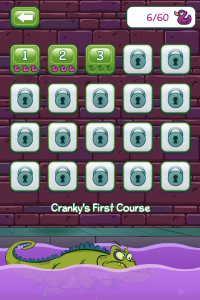 We start with “Cranky’s First Course”. There is a teaser of the “Hunger Pains” levels, but we’ll have to pay to get access to those! 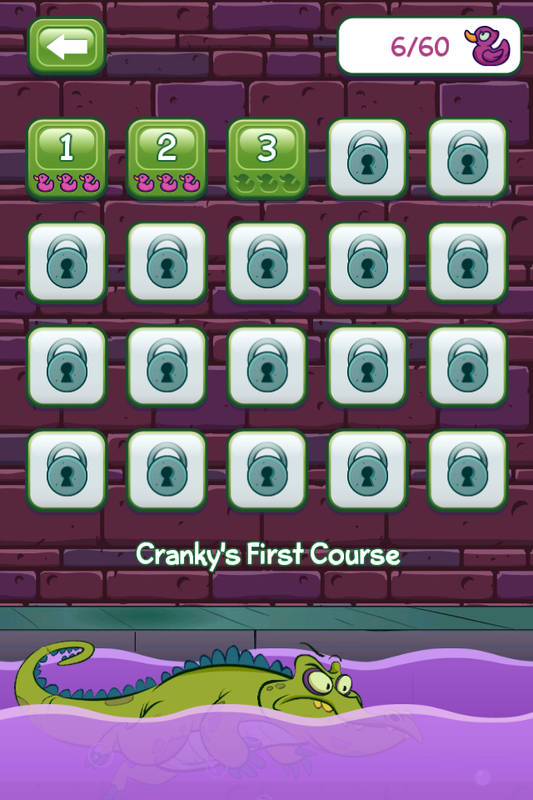 Starting Cranky’s First Course, we are presented with Cranky Challenge 1. 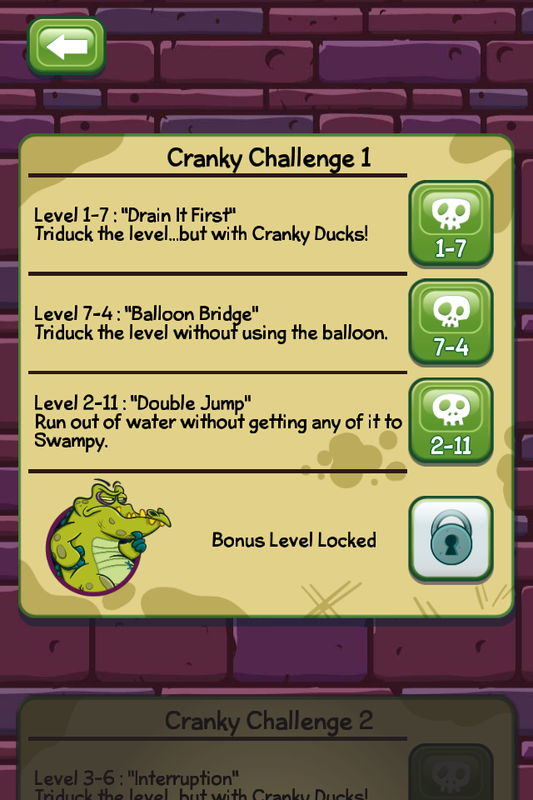 Level 1-7 : “Drain It First” – Triduck the level…but with Cranky Ducks! 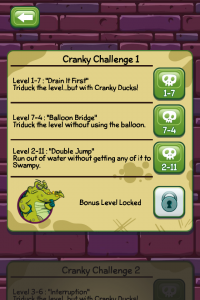 Level 7-4 : “Balloon Bridge” – Triduck the level without using the balloon. 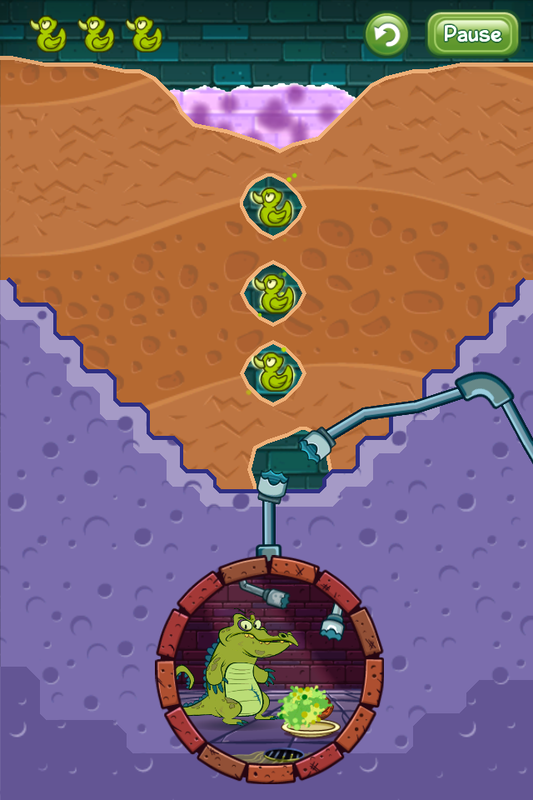 Level 2-11 : “Double Jump” – Run out of water without getting any of it to Swampy. 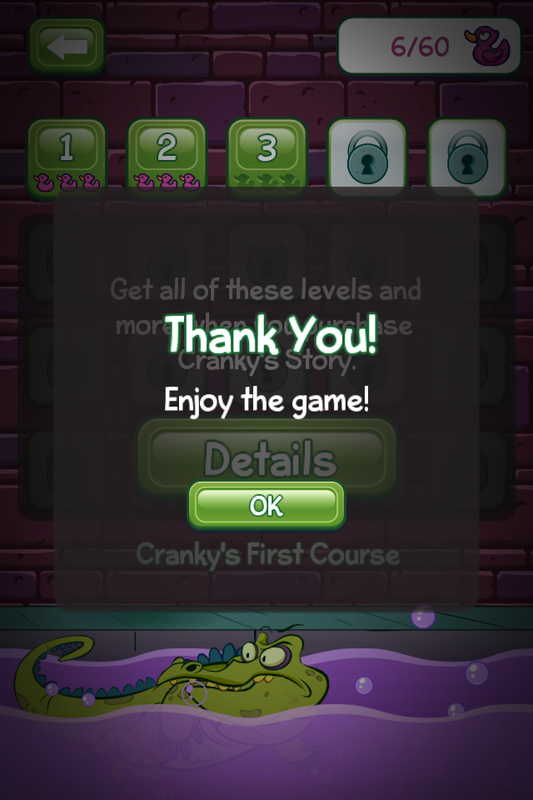 Let’s get the party started and play these new levels! You’ll immediately notice that it looks very familiar, but with a Cranky twist. You are play with purple acid instead of the water that you are used to. 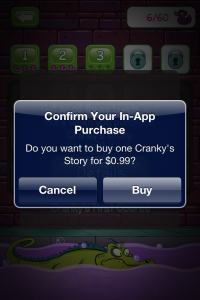 To gain access to the rest of Cranky’s Story, you need to do an “in-app” purchase. It is intereting that they chose to do an in-app upgrade/purchase, instead of doing a separate app purchase like Angry Birds Seasons or Angry Birds Rio. Thank you for playing and for all of your feedback! We have resolved crash bugs related to the Cranky’s Story update, and have fixed other minor issues to optimize the overall gameplay experience. 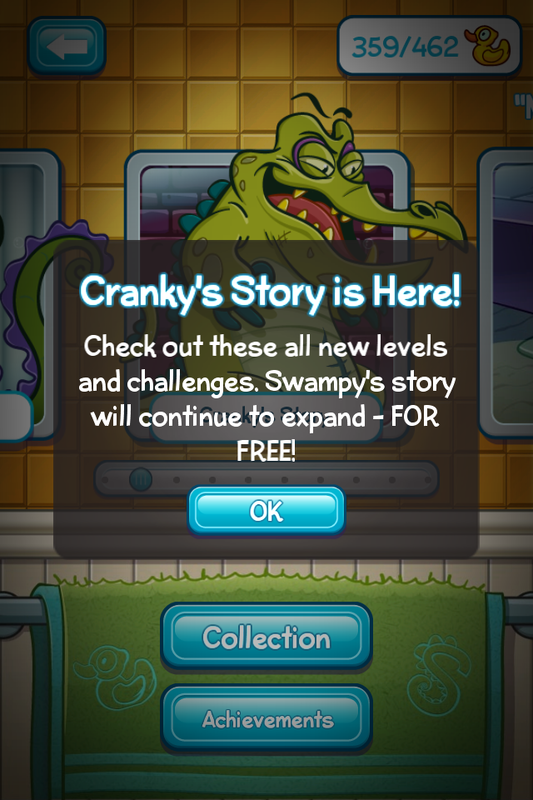 Coming soon – more free updates to Swampy’s Story! 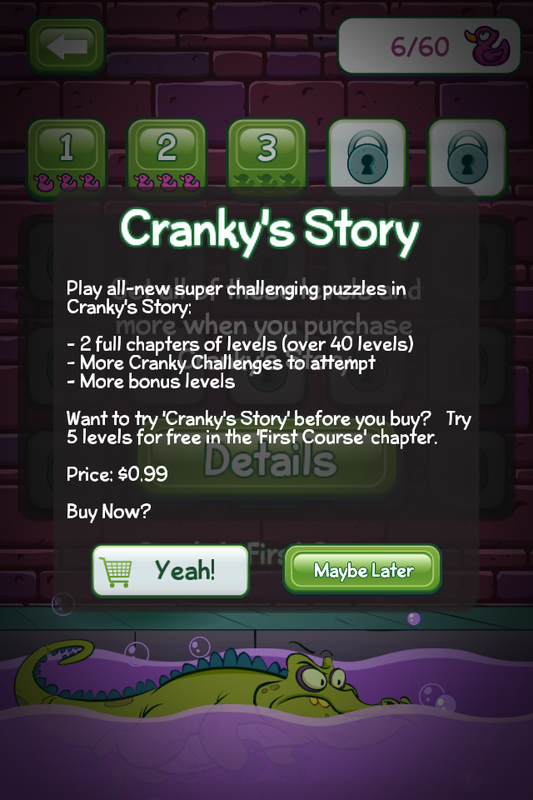 Now test your skills with “Cranky’s Story”! Enjoy five of these all-new puzzles for free! 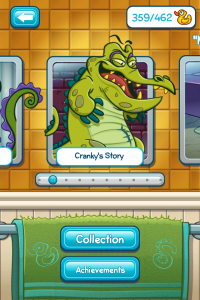 Cranky is the toughest alligator around, and he has worked up an appetite from sabotaging Swampy’s water supply. He eats anything, especially all the rotting and disgusting junk found in the dumps and sewers. 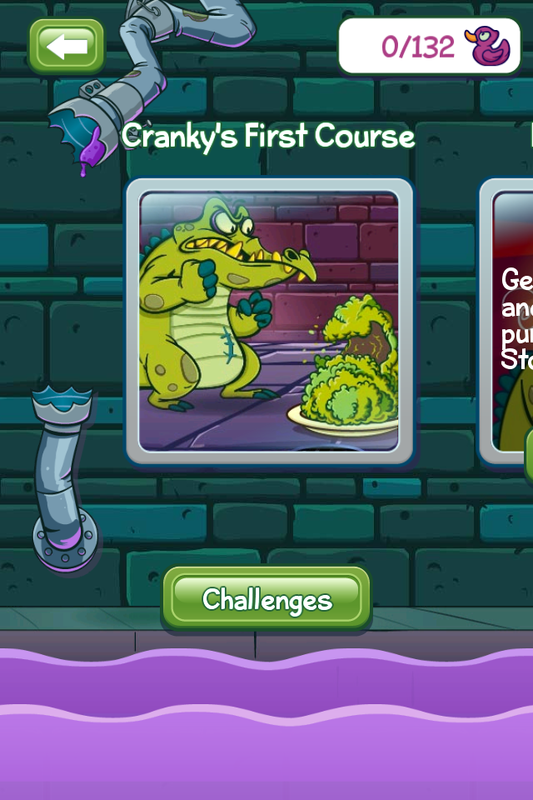 Cranky will not eat vegetables however, and now his food is covered with vegetable-like algae. 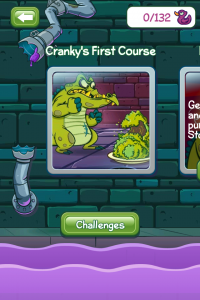 Use the dirty purple water to clean off Cranky’s plate so he can eat! 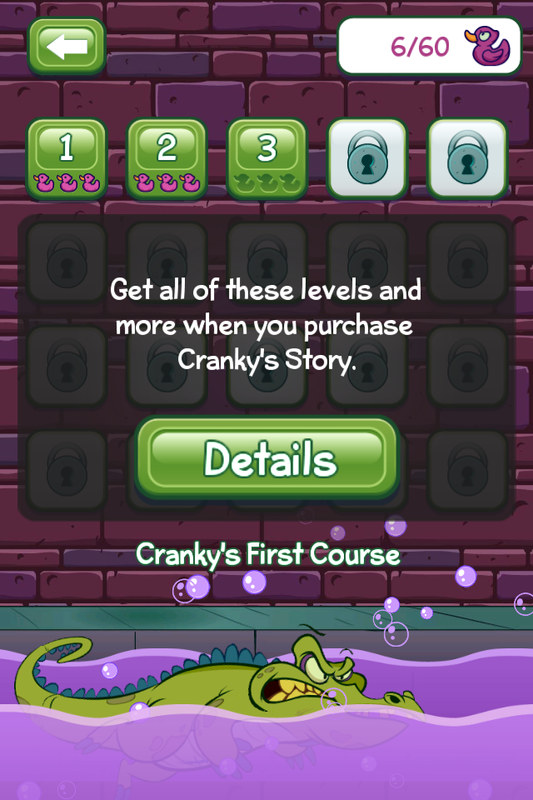 Cranky’s Story is an in-app purchase with more than 50 super-challenging puzzles, including Cranky’s Challenge – four unique puzzle packs with 16 special levels for the most-skilled puzzle solvers. I have a kindle fire, and have tri-ducked every thing, and it says that it would expand for free. Idk how to make it expand. Help! I have the Nook tablet, I can’t find an update to allow me to see/play crankys story. Is it available on the nook yet? I haven’t been able to find any indication that they released it on the Nook yet. Odd! 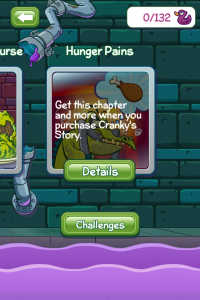 Will Crankys story be made available for nook? I love Wheres my water & have been looking forward to new lvls. I have no idea, and have not seen anything official. Others have asked the same thing, so you are not alone. I suspect that if they haven’t done so by now, that they likely won’t be releasing it for Nook. I’m sure you already tried it, but you could power cycle the device… and also try deleting the app and reinstalling? Great game. Not too easy where you’d get board and not so hard that it becomes a chore. Makers should focus on making future levels more fun and interesting–not necessarily harder. 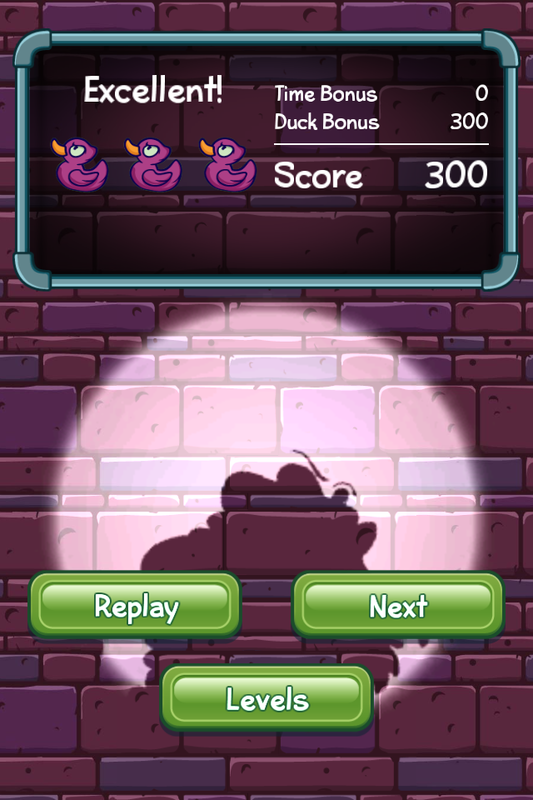 Out to Dry for example is done RIGHT – easy to triduck all 20 levels but still fun when doing so. Only possible downside: don’t ruin it by getting greedy. Good value so far but I can see this going down the road of too many petty in app purchases and that will destroy a good thing.